Lumber and building materials (LBM) supply businesses today are facing pressure from increased competition and the need to keep pace with digital transformation. Against this backdrop, some businesses struggle while others thrive. The difference is having people who understand what it takes to get set for growth—individuals with the vision and drive to take your business to the next level. We call these people the Grow Getters. Strategic planning, a focus on external opportunities, a customer-centric outlook, and the ability to deal with constant change are four key traits of high-growth companies. You can support each of these areas with Epicor LBM business management solutions. At Epicor, we have a suite of industry-specific solutions for LBM distributors, as well as an leading service team to help your business move forward. 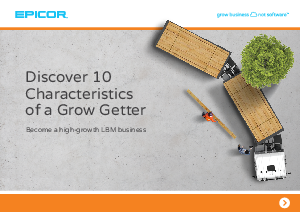 Take a look at our report to see how you can get set for growth and become a Grow Getter.